(left) Park Bo-Young and Wang Seok-Hyun, and (right) Cha Tae-Hyun in the blockbuster The Scandal Makers. The Skinny: Blockbuster Korean film about a single man in his mid-thirties whose life is turned upside down by his long-lost daughter and an adorable, precocious grandson. This high-concept comedy may sound like commercial fluff, but talented performers, smart direction and agreeable laughs make this a crowd-pleasing winner. The Scandal Makers broke box office records in Korea, and after seeing the film it’s hard to fault audiences for spending their box-office dollars. An enjoyable comedy made for popular appeal, Scandal Makers features many commercial elements: a likable and proven leading man, a young and photogenic leading lady, a sitcom-worthy premise, family-friendly laughs and – perhaps most important of all - an adorable little kid. Director-screenwriter Kang Hyoung-Chul has made a film for the masses, but Scandal Makers earns its “thumbs up” for more than just the obvious – it’s got a solid script and smart direction, too. The adorable little kid still helps a lot, though. 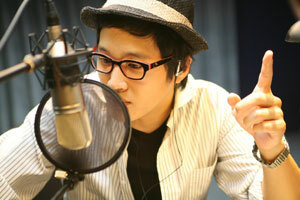 Cha Tae-Hyun (My Sassy Girl) stars as Hyun-Su, a former TV actor turned popular radio personality. Hyun-Su's ratings rise when he counsels a single mother over the airwaves to seek out her long-lost father and show up on his doorstep with her young son. Despite his advice, Hyun-Su pities the unsuspecting grandfather because he’s an avowed player and happy with the single life. Too bad that he’s actually the unsuspecting grandfather; single mother Jung-Nam (Park Bo-Young) is his daughter from his ninth grade affair with an older woman, and Jung-Nam was pretty young herself when she conceived her son Ki-Dong (Wang Seok-Hyun). Together, the combined age of the three generations barely cracks 60. Planned Parenthood would have a fit. Scandals can spell doom for popular personalities, and with his star currently on the rise, Hyun-Su would like to avoid bad publicity. However, Jung-Nam forces her way into his home and life, demanding shelter in exchange for her silence. Meanwhile, she pursues her dream of becoming a singer, and coincidentally Hyun-Su's radio show is hosting a singing competition. Jung-Nam soon shows up at Hyun-Su's studio to audition, while Hyun-Su fumes in the background and little Ki-Dong heads off to school. Hyun-Su lightens up a bit when he develops a crush on Ki-Dong's babelicious teacher (Hwangwoo Seulhae) and recruits young Ki-Dong to be his assistant matchmaker. Predictably, bonds develop between the three, but conflict isn’t far off, either. Besides the omnipresent threat of scandal, there’s the simple trial of adjustment. Can Hyun-Su finally give up his swinging bachelor ways for a three-generation household? Spoiler alert! Of course he can, but like all commercial movies in our modern “seen-that-before” film consumption culture, the trick to a quality film isn’t really what happens, but how. In that, Scandal Makers does its job exceptionally, moving at an entertaining pace and developing its story well. There’s some convenience going on, but director Kang makes good use of all his characters and situations. There are no extraneous parts here; every element that's introduced returns in a welcome and appropriate fashion. Also, the filmmakers shows restraint, choosing not to lean on sappy montages or out-of-nowhere plot devices to grab the audience. There's a third act dip into drama, but by then the characters have endeared themselves to the audience - and hey, it's only drama, not melodrama. Simply for not going over the top, the filmmakers receive extra points. Notes:  Second place winner of the Audience Award at the 11th Udine Far East Film Festival.  The Scandal Makers has been optioned for a Hollywood remake by director Barry Sonnenfeld (Men in Black).